The 2011 New York Comic-Con was held this weekend providing some info and look at upcoming plans for Transformers for Dark of the Moon, Transformers: Prime, Fall of Cybertron, and Transformers: The Ride. Below are the news highlights with links to galleries and panel videos. • TF: Prime - Calling 2012 "All Prime All The Time"
• TF: The Ride - Evac will get a deluxe and legion class releases. • TF: The Ride - Attendee's treated as NEST new recruits when a Decepticon attacks requires boarding Evac to take the AllSpark fragment to safety. 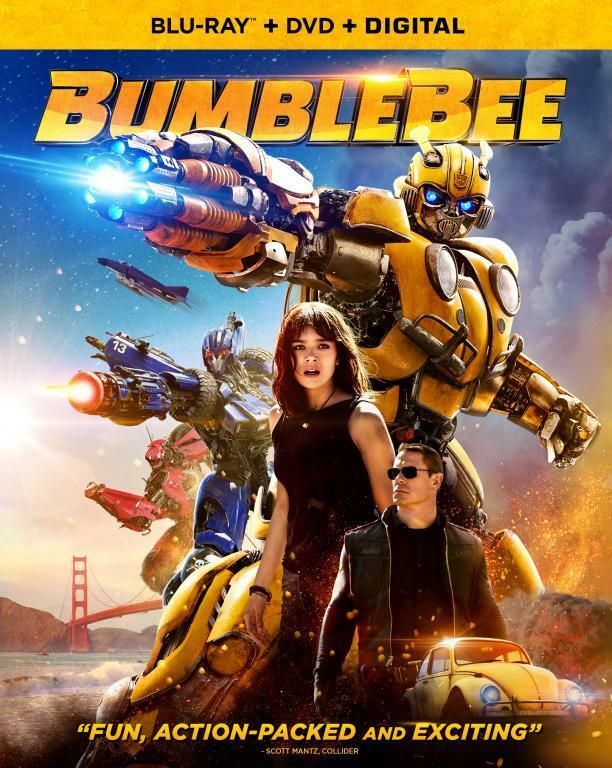 Characters making appearances include Ratchet, Ironhide, Ravage, Bumblebee, Optimus Prime, Megatron, and Grindor. • Fall of Cybertron: Jazz playable character, part of the story of game will be to follow the fall out of the creation of the Dinobots by Shockwave. • Fall of Cybertron: Grimlock will retain his G1 speech mannerisms but cause isn't lack of brainpower but because of interference from the power boost forced on him. 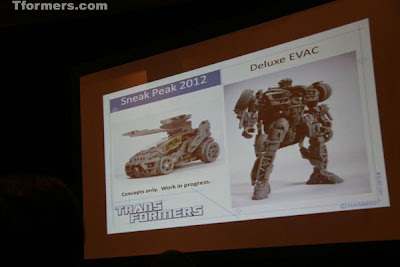 • Fall of Cybertron: Toys are planned for next years Generations line. 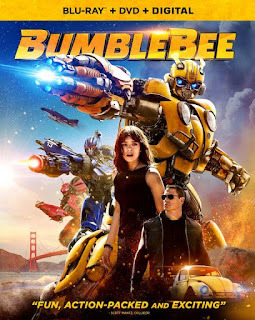 • Two episode arc will explain Bumblebee's voice-less issues. Soundwave will eventually speak. • Starscream and Whelljack return, Dinobots are being considered. • Tony Todd will voice Dreadwing. Nathan Fillion (and other celebrity actors) being considered for other characters. • Noses, eyebrows, etc part of character design to help humanize them so more relatable to audience. • On somewhat related note, G.I. Joe: Renegades put on hiatus. Good show, not sure if hiatus is to get The Hub profitable faster or a prelude to outright cancellation. • Arcee blue instead of traditional pink since Jack wouldn't ride a pink bike. 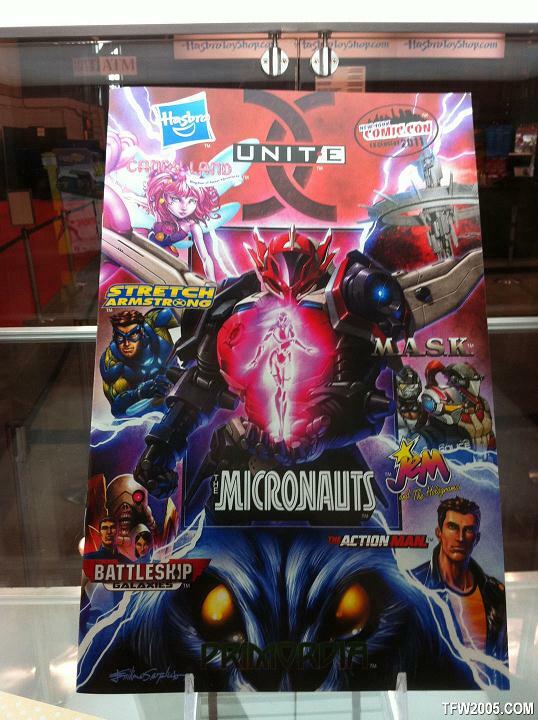 • Unit:E revealed as project that involves Micronauts, Candyland, Stretch Armstrong, Battleship, Jem, Action Man and return of M.A.S.K. No details beyond a teaser image. 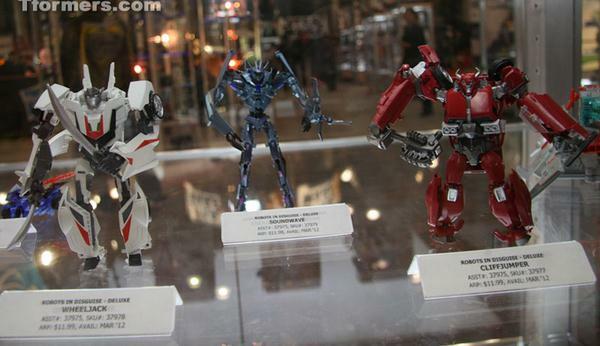 The ONLY toys I'm interested in are the eventual releases of Soundwave, Mirage/Dino, and Wheeljack/Que. Is Hasbro trying to blue-ball us?